As more and more Americans become aware of global climate change and environmental protection, more and more men’s timepiece wearers would want a more earth-friendly timepiece. While solar cell-powered calculators and watches have been around for a long time, their design left a lot to be desired. They looked cheap, fragile, and, well, kind of tacky. Thankfully, if you are looking for a more eco-friendly watch, good old Japanese watch manufacturing and design technology has pulled through and you can now look great while while sporting a solar-powered timepiece. It is no surprise that Japanese stalwart Citizen has a model that fits these seemingly difficult design parameters. Clunky. Cheap. Fragile. These are just some of the words that used to be thrown at solar-powered watches. After all, these watches look like they are mere miniaturized calculators strapped to your wrist. 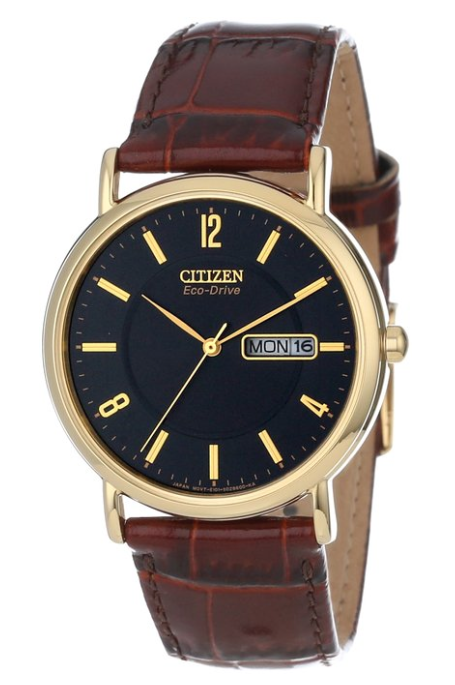 Thankfully, the Citizen Men’s BM8242-08E “Eco-Drive” takes the ick factor or awkwardness of previous solar-powered wristwatch designs and succeeds in fusing a great deal of classic styling with environmentally-friendly watch operations. Of course, this shouldn’t be a surprise. This is, after all, Citizen we’re talking about. Citizen is part of the Japanese wave of watch manufacturers that economically democratized quality watches. Thanks to Japanese high precision and high quality manufacturing, high quality watches at low prices have become a reality. Citizen applies this same level of manufacturing expertise to develop a smart-looking watch that looks awesome while harnessing the sun’s power. You can’t tell, just by looking at this timepiece, its solar mechanism. That’s how tightly designed this watch is. It has all the classic elegant touches of vintage design, the great brown pigskin leather strap, the gold-tone stainless steel bezel, and the buckle clasp. This timepiece can easily pass for a 1950s timepiece. Who says you can’t look smart and fashionable while tapping the sun’s power? This timepiece has an analog display partially powered by Japanese quartz movement technology. Thanks to its solar power source, you get a nice day date display. This feature works smoothly and doesn’t clash with the overall design and look of the timepiece. The Eco-Drive marries the high-precision quality-conscious mass manufacturing capabilities of Citizen with the newest solar cell technology to create a sleek ecologically in tune timepiece within a tight form. If you are looking for a smart-looking watch packed with a lot of eco-friendly technology which you can take with you to a wide variety of settings and activities, this watch model is for you. Not only do you look great and have a great timepiece accessory that fits the wide range of places you might find yourself in, you are also wearing a very powerful implementation of solar cell technology on your wrist. To top it all off, you get to do so the Citizen way-that’s right, you get great timepiece technology, high quality values, and a great fit at a price that won’t burn a hole through your pocket. This shouldn’t be a surprise. After all, this is Citizen we’re talking about.